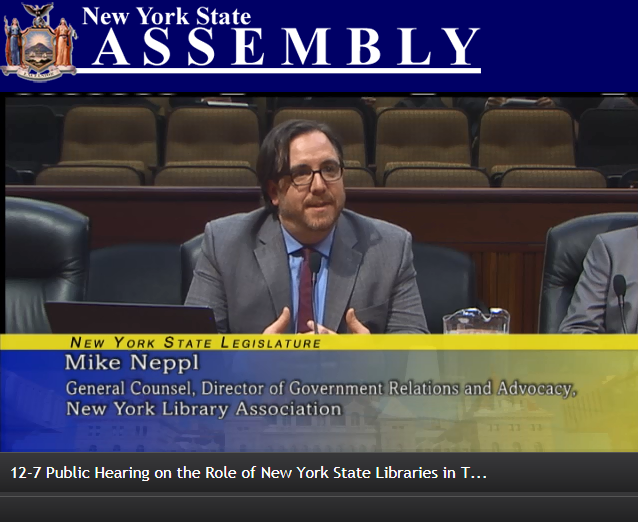 The New York Library Association's Mike Neppl told lawmakers the state's funding formula for libraries is outdated. Libraries in New York are facing new challenges in the 21st century, but the state isn't funding them well enough to meet them. That's according to witnesses who testified before the Assembly's Committee on Libraries and Education Technology today. Mike Neppl is Director of Government Relations and Advocacy for the New York Library Association. Citing statistics from a Siena poll, he told lawmakers the current funding formula provides libraries tens of millions of dollars less than they need to deliver the services their patrons rely on. "40 percent of households earning less than $50 thousand dollars a year have sought career building and job training programs at their local library, and maybe most importantly, 25 percent of households earning less than 50 thousand annually indicate that the local public library is their primary point of internet access," he said. She says the board of regents recommends that if the statutory amount of funding is provided, library aid should increase from its current $95 million dollars to $102.6 million. "However, funding needs are often greater than available resources, and this year is certainly no different. There remains a pressing need for additional state support," she said. Elia say over half of the state's libraries are over 60 years old, and more than 20 percent are not fully accessible, and there is a great demand for increased broadband connectivity. The panel plans to look at the programs and services now provided by libraries around the state. They'll also review current state funding for libraries, and whether more can be done to support them. Friday's hearing comes as the entire Legislature prepares to return to the state Capitol to kick off the 2019 session in January.